CRM is an acronym that stands for customer relationship management. It describes the strategy that a company uses to handle customer interactions. One example of a common CRM strategy is the rewards card program that many supermarkets offer. In this case, the store gives its customers a free card that grants them access to special deals and discounts when they swipe their rewards card during checkout. However, that card also registers and tracks everything the customer buys. This allows the store to create an extremely detailed customer profile based on the purchasing habits of the customer. Armed with that information, the store can then offer its customers targeted coupons—as well as other programs—that ends up motivating customers to buy more products from that particular store. 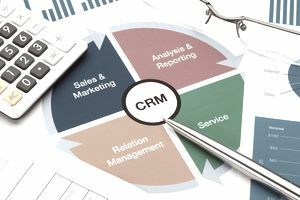 And CRM is not just for grocery stores; every business—from vintage dress companies to car dealerships—can benefit from a CRM program. Many CRM software and/or service packages exist only to help companies manage the customer relationship process. Salespeople tend to think of these computer programs as the be-all and end-all of CRM. However, CRM has existed for much longer than the computer. CRM has been around, in one form or another, for as long as people have been buying goods. That said, computers have greatly enhanced the customer relationship management process because the key to good CRM is uncovering and storing information about customers. The more a company knows about its customers, the better it can manage its valued relationships—as evidenced by the supermarket rewards card example. CRM systems also have the benefit of seeing how well each sales team is doing—and track the performance of the products they sell and the campaigns they implement. Also, each sales manager has access to information about whether their teams are achieving their sales goals or not. The ability to map out an entire customer journey—from the first contact to the point of sale—is another huge benefit to a business because it allows for accurate forecasting when it comes to determining customer need. Also, given today's love affair with social media, being able to view a customer's social media activity (especially their likes and dislikes), businesses can gauge customer sentiment about different brands. CRM software helps produce additional sales by storing all the customer information in an easy-access format. With a typical CRM program, new leads are entered into the program's database, and salespeople add notes throughout the sales cycle. After that, it's easy for a company to compile reports from this data that help it design a CRM strategy that becomes a custom-tailored profile of each customer. For example, the customer of a high-end women's clothing store may gain 20 pounds and need to purchase a different kind of dress silhouette. Or a car dealership will note that a customer whose child is approaching 21—and ready to purchase her first car—will be invited in for a test-drive offering a percentage of their vehicle of choice. Another benefit is that the CRM software can automatically send out emails to individual customers, as designated by the salesperson. For example, a salesperson might program his CRM to send out a thank-you message whenever a customer reaches a one-year anniversary of purchase. The salesperson can also further personalize the relationship by sending an e-card on the customer's birthday. Once a company has collected information about a customer, it's imperative that the company train its salespeople and other employees in using the profiled information to keep the customer relationship strong. A salesperson is not the CEO of the company but is the face of the company. The role a salesperson plays is important in any CRM program. Most often, a customer who runs into a technical or billing problem will phone or email his salesperson instead of calling the customer service team. That's because the customer already has a relationship with the salesperson, has bonded with and, most importantly, trusts that person It's always safer and easier to reach out to someone you know than to try to explain your issue to a stranger. And all skilled salespeople know that after-sales customer service is more important than before-sales customer service. Although customer interactions can be time-consuming and burdensome for a salesperson, they can also hold the key to future sales. When a salesperson helps a customer solve a difficult problem, it's much more likely that the customer will continue to make purchases from that salesperson because a bond has been created. There's also a very good chance that the customer will send friends and family members to that salesperson as well. In the end, this bonding experience and good word of mouth are exactly what a customer relationship management system is trying to accomplish. It's critical that every member of a company's sales team understands and implements its company's CRM strategy. It is one of the key ways a salesperson can be successful, and in turn, make the company successful. Of course, it's not just the salesperson and the company that benefits from CRM systems. Customers are better served on a daily basis. Each customer profile is highly targeted to help ensure customer satisfaction. It allows for improved pricing to meet customer budgets. The customized products and service offerings make purchasing more efficient. The individualized marketing messages (otherwise known as campaigns) make customers feel as though they have a "personal shopper." Customers can connect with salespeople on a single platform. The integrated platform helps prevent customer profile error.